I purchased a "Tested and working" Timex 1500 complete "kit" off eBay. It arrived today! WooHoo! Unfortunately the 1500 tries to boot but it displays thin lines and never boots up completely. Tested the PS and TV hookup with a known working TS 1000 just fine.. Pulled the cover and other then one keyboard cable broken a little bit, I didn't see any obvious damage to the system. Hoping it was just a loose I.C. I could re-seat. Anywho, the 2020 Tape drive works and I have everything except for the wall-wart for the 2020 drive. Works on batteries tho. Pic of failing bootup.. sigh. Any quick ideas? 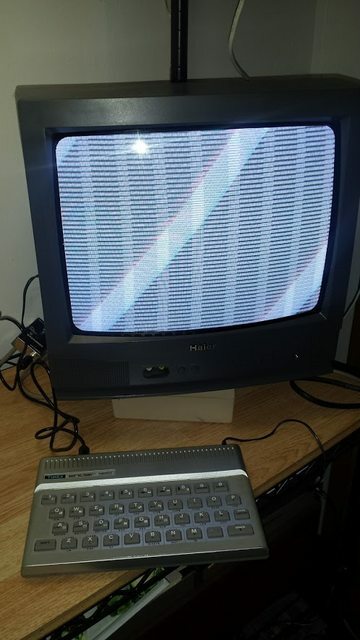 I contacted the seller and expressed my concern about this "MINT Working computer".. If it was advertised as working, ask the seller for a partial refund (I’m assuming you want to keep it and the other bits). I recently discovered a power supply in with my ZX81 stuff that was capable of running a bare bones ZX81, but was not up to the job of a ZX81 with memory pack. Screen puke of various description. (Tossed it out of there of course.) Try another power supply unit, just in case. Got a hold of the seller.. Seems to be concerned and willing to work with me. I tried another power supply from my working 1000 system that works with the RAMPAK. Same issue. Scrambled video. Don't know what I will do. 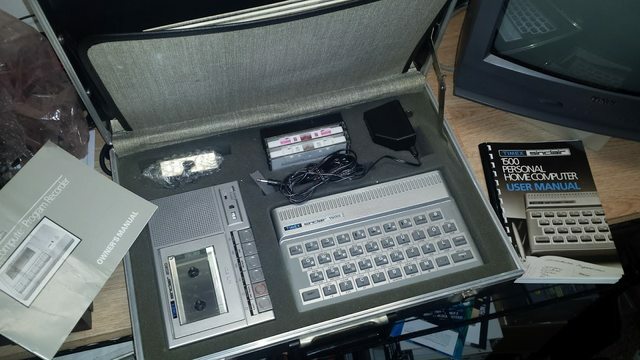 On one hand; I have the complete setup for a 1500 with 2020 and manuals, tapes and all the training guides the bundle originally came with. Even an ERATTA update for the 1500. lol. Im sure I will just keep the kit and work something out with the seller. Will have to keep my eyes open for another 1500 eventually. Or maybe entertain offers here?? I am also a American. How does your TS1500's voltages read? There are soldered 8 DRAMs inside the TS1500. These DRAMs demand GROUND, +5 VDC, -5 VDC and also +12 VDC. If not, then check these electrolytic capacitors. Wellp. Seller agreed to refund. As much as I wanted to keep the 1500, I really had no use for a dead Timex 1500. bummer. If you haven't sent it back yet. Try connecting a 16K RAM pack and see if it boots. I have one that does that and it has bad RAM, and I just use it with a RAM pack attached.